The Explorer was created by Victor Tolgesy and was "shown at Expo '67" states the Brandon University Archives website (and in a separate report by the Ottawa Citizen also backs up that claim.) 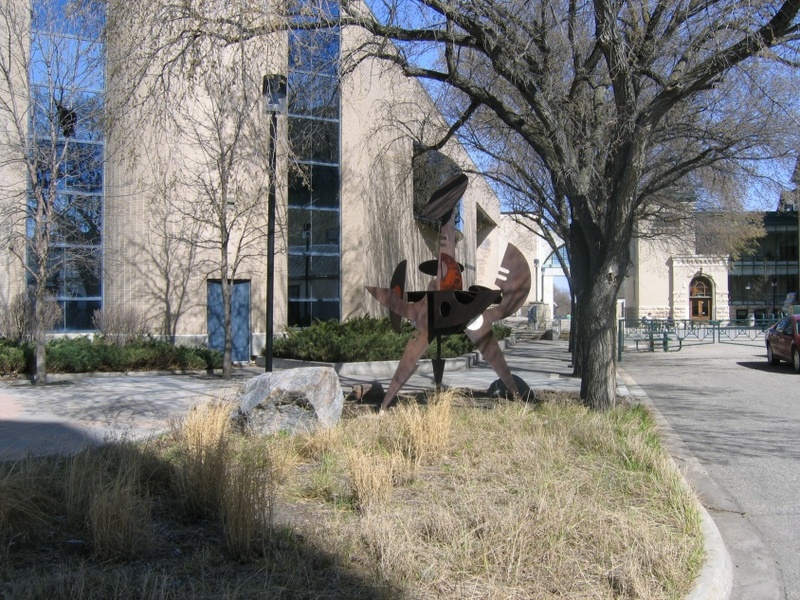 After Expo 67, the sculpture was then presented to Brandon University where it was "[o]riginally displayed at the southwest corner of the Western Manitoba Centennial Auditorium, the Explorer was moved to the flower bed between the Physical Plant H-Huts and the George T. Richardson Centre in May 2008". The move was part of Brandon's beautification project. In 1968, Tolgesy created a smaller version of the Explorer called Explorer II with this one currently located on small island of Brewery Creek in Gatineau. A report filed by the Ottawa Citizen described Explorer II with "round and angular shapes — made of corten steel, the same metal used to make warships — evoke images of distance places. Considering its origins, that’s appropriate. As the plaque explains, the sculpture was created more that 40 years ago when mankind was imagining a future among the stars." For exclusive photographs of Explorer II, click here. Tolgesy was born in Hungary and emigrated to Canada in 1951. From the early 1950's to 1980 he lived and worked in Ottawa. An accomplished sculptor, many of his works can be seen in the Ottawa-Gatineau area including McClintock's Dream (circa 1978) in the By Ward Market Building mezzanine and Man's Fortunes (circa 1973) which appears high above the main entrance of the Ottawa Public Library. Regretfully, Tolgesy passed away in 1980 but his legacy lives on. "The Victor Tolgesy Arts Award was inaugurated in 1987 by the City of Ottawa and the Council for the Arts in Ottawa to recognise the accomplishments of residents who have contributed substantially to enriching cultural life in the city," writes the Ottawa Festival Network. "A cash prize of $5,000 is associated with this award. The award recipient also receives a bronze casting special edition version of the late Victor Tolgesy’s 1963 sculpture entitled Seed and Flower provided by the City of Ottawa." Related video link: The first retrospective exhibition of the works by Victor Tolgesy was held from December 9, 2005 to January 22, 2006. It was organized by the City of Ottawa and the Karsh-Masson Gallery (the Gallery is located at 136 St. Patrick Street, Ottawa.) By clicking on this active link, a short video reveals the creative genius of Victor Tolgesy.